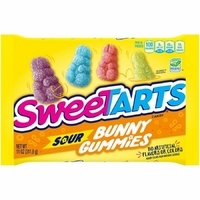 Gummy sweet tart sour gummy bunnies are yet another great wonka candy. Fruit flavored gummy candy in the shape of little bunnies. Each bunny is not only gummy but is covered with a tart sugar making these little guys a great tangy candy. Place these in your favorite candy bowl and watch them just hop away.